Petz, Plush toys, animals, anything cute really, pink, some Anime and Manga, Disney movies and Studio Ghibli movies. Five Nights at Freddy's, the Sims 3, various other games. Mainly, The Lion King! Also into some Kim Possible, Five Nights at Freddy's, Once Upon A Time, and Avatar/Legend Of Korra fandoms. Babyz, Oddballz, Petz 3, Petz 4 and Petz 5. My P5 crew won't be listed on the site, because it's about as big as my P4 crew. Too much extra work to get it all up! Anything, really. But everyone has their favorite traits! These would be mine! Let's see, what else. I have a sister who goes by Periwinkle/Peri/Perichan. She did the layout of this site, and the drawings on this page! I also have some real life pets too! 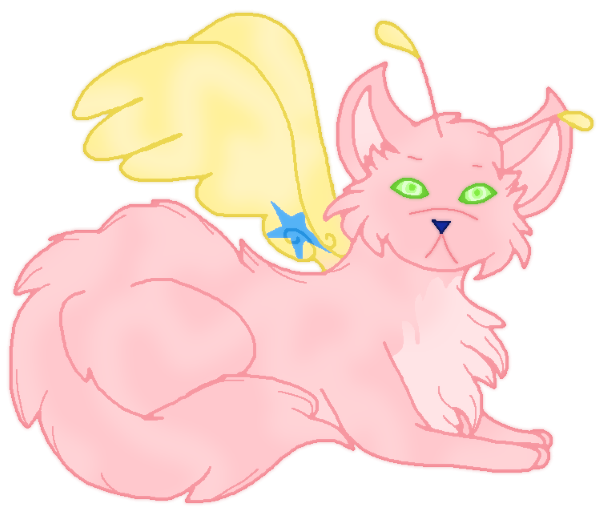 If you want to know what a Cat Creature is...it's what I dubbed the pink, yellow-winged cat you see here. She's my "non-realistic" fursona, Cali! She's a spirit that lives inside my character, Lily, and they can "swap out" bodies. 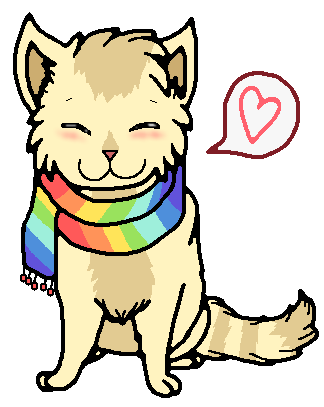 (Basically, Lily can become Cali, and vice-versa) I decided one day to design what Lily would look like as a regular cat...and then Lilycat the "realistic" fursona was created. She's a separate being from Cali, and until her creation, Cali was used to being called "Lily's fursona" so she's not too sure she likes this new "imposter" taking her role. Poor, foolish Cali. It's just me, your friend!! 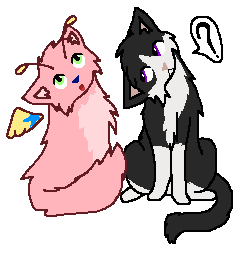 Lily/Cali's friends in their animal forms. You already know about Lilycat and Cali from above, so here's some about their friends instead! Ikiri is brave, calm, and a bit of a flirt. He seems to love driving Lila nuts. Lila, loves to scope out guys, and has always acted like a mother figure to Lily/Cali and Lili. She does get frustrated with them easily. 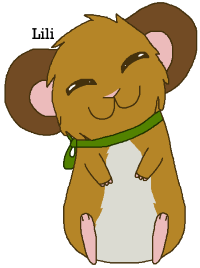 Lili, the hamster. Lily/Cali's best friend. She's hyper, random, food-crazy and silly, but when Lily/Cali need her, she's there for them, and always seems to know what to say to help. Humeir is super shy and has a crush on Lily/Cali. He rarely speaks up, and often hides behind Lily/Cali, but he's got a very pure heart and is a trust-worthy friend. Tora, sister to Suzu. She's very clever, and mature for her age. She's very sweet and friendly, but cross her and she'll 'snap', and anybody who knows what 'Tora snapping' means, knows not to 'activate' it! Suzu, sister to Tora. She and Lily absolutely love each other and are constantly together. Suzu is loud, energetic, and a bit athletic, and super friendly. She's a bit of a tomboy, but she is a truly wonderful friend to anybody.